Hieronymus Bosch (c 1450–1516), The Last Judgment (central panel, detail) (c 1495-1505), oil on oak panel, left wing 99.5 x 28.8 cm, central panel 99.2 × 60.5 cm, right wing 99.5 × 28.6 cm, Groeningemuseum, Bruges, Belgium. Wikimedia Commons. 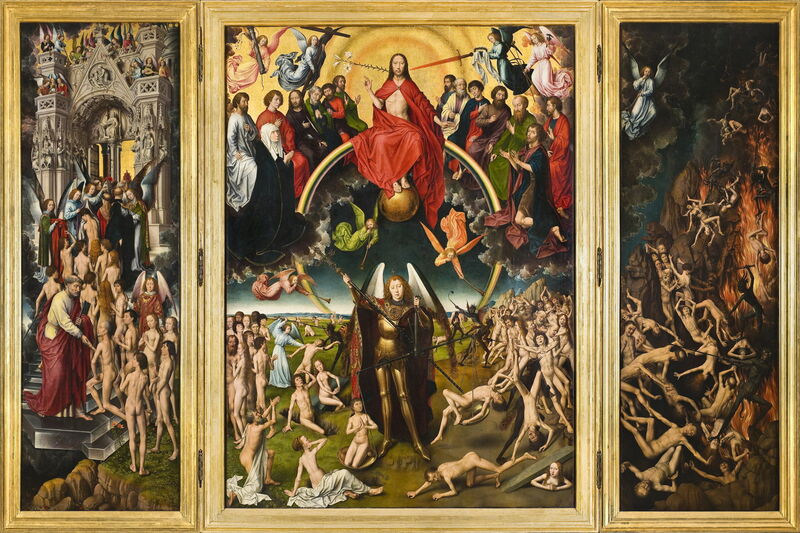 One of two triptychs painted by Bosch showing the Last Judgement, it is rich with his unique creatures, but full of vivid warnings of the horrible fate that awaits those who turn their back on Christ’s sacrificial redemption. Another popular theme for triptychs to be placed in places of worship was the end of the world and its last judgement, in which the good would rise to heaven, and the bad would enter purgatory. Identified and detailed in teachings of Jesus Christ recorded in the Gospels – particularly the account in Matthew chapter 7, verses 13-23 – it had support in more traditional Old Testament eschatology (Daniel, Isaiah), and elaboration in the book of Revelation. In the Christian tradition, the Last Judgement is strongly linked to Christ’s crucifixion, which was his suffering so that mankind could be saved at the Last Judgement. Although often seen as hellfire, damnation, and destruction, it has strong doctrinal links with redemption through Christ, and Christ as the saviour of man. Bosch made those links in the painting on the exterior, and in the dominating image of Christ at the top of the centre panel. Hieronymus Bosch (c 1450–1516), The Last Judgment (c 1495-1505), oil on oak panel, left wing 99.5 x 28.8 cm, central panel 99.2 × 60.5 cm, right wing 99.5 × 28.6 cm, Groeningemuseum, Bruges, Belgium. Wikimedia Commons. 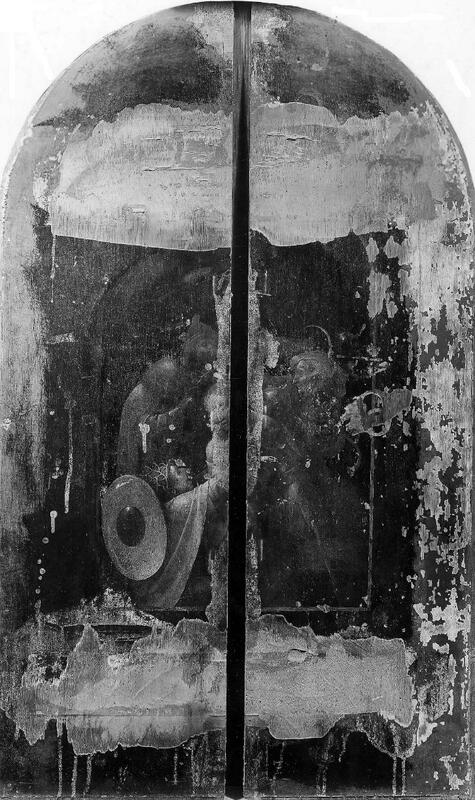 A plain grisaille painting showing Christ being crowned with thorns, now badly worn, covers a depiction within, showing Christ presiding over the torments and destruction of the Last Judgement. Hieronymus Bosch (c 1450–1516), The Last Judgment (exterior, Crowning with Thorns) (c 1495-1505), oil on oak panel, left wing 99.5 x 28.8 cm, central panel 99.2 × 60.5 cm, right wing 99.5 × 28.6 cm, Groeningemuseum, Bruges, Belgium. Wikimedia Commons. The reverse, which forms the exterior of the triptych when folded, is a substantial and detailed grisaille painting showing Christ and the soldiers who crowned him with thorns during the Passion. Jesus Christ is at the centre of the group of soldiers, his head just on the left side of the split. A soldier wearing unusual headgear camouflaged with branches, which are prominent just above the circular shield on his back, reaches up to Christ with his right arm. The soldier placing the crown on Christ’s head is on the left, with his right hand and forearm covered in armour, similar to that shown in Bosch’s The Crowning with Thorns (London). Opening the triptych reveals an almost continuous view over its three panels, their dominant colours being reds and browns. Although they are rich in detail, their content is not as intense or compressed as that in The Garden of Earthly Delights, for example. Overseeing the view from the top of the centre panel is Christ, surrounded by angels and those who are with him in heaven. The rest of us are condemned to suffer the fates shown explicitly in the lower sections of the panels. The three panels show a gradation in the severity of torments, from the left where events are portentous but not yet apocalyptic, to the right, where all hell breaks loose. Hieronymus Bosch (c 1450–1516), The Last Judgment (left wing) (c 1495-1505), oil on oak panel, left wing 99.5 x 28.8 cm, central panel 99.2 × 60.5 cm, right wing 99.5 × 28.6 cm, Groeningemuseum, Bruges, Belgium. Wikimedia Commons. The left panel shows a relatively normal landscape of meadows, a lake, and woods, receding into rolling countryside with lakes in the distance. Although the meadows and trees appear quite brown, they have become discoloured from their original greener colours. In the immediate foreground a naked figure climbs underneath a projection of a huge and strange fruit. To the right, three people kneel at the side of a woman wearing rich red robes and playing a harp. Behind them is a small lake, on which a curious boat is floating. It contains an elaborate circular red marquee, inside which are many more naked people. At its prow, three pale angels play a fanfare on their straight trumpets. Behind them, in a meadow, is an ornate and tall fountain tower. Towards its top, on a terrace, a clothed man points up into the sky. To the left of the tower is a huge red fruit, within which more people are sitting. Various figures in that meadow ride a unicorn, sit by a peacock, and try to catch a bird using a net on a very long rod. There are birds in the sky, and six angels flying near a patch of grey cloud, in which there is evidence of an underdrawn circle, which had earlier been intended to be a representation of God the Father. 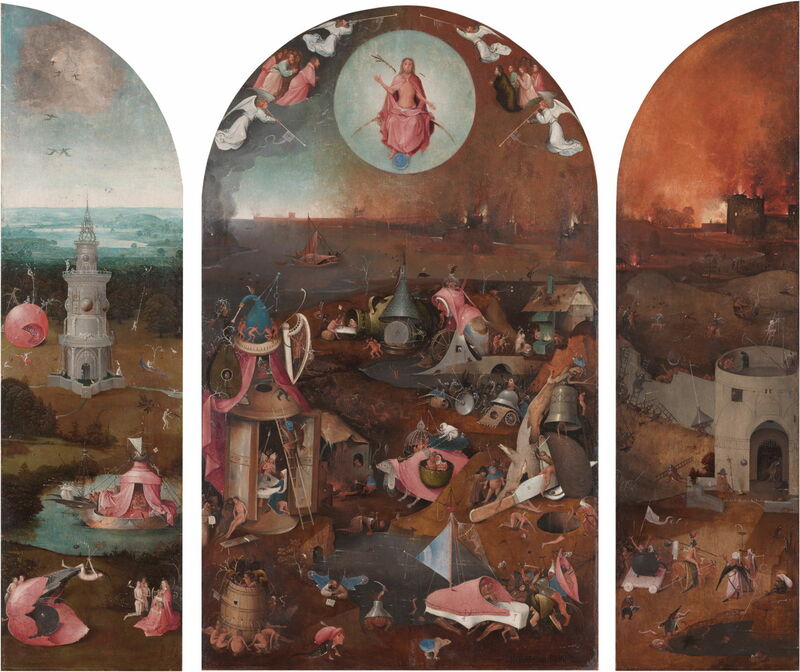 Hieronymus Bosch (c 1450–1516), The Last Judgment (central panel) (c 1495-1505), oil on oak panel, left wing 99.5 x 28.8 cm, central panel 99.2 × 60.5 cm, right wing 99.5 × 28.6 cm, Groeningemuseum, Bruges, Belgium. Wikimedia Commons. The centre panel consists of an earthly landscape stretching from disturbing village scenes in the foreground, to fire and destruction in a port in the distance. Above that, Christ occupies a circular light blue area of ‘heaven’, and around him are angels and figures of the faithful. The foreground shows a variety of bizarre scenes occurring around a small pond. At the bottom left, naked bodies are being put into a large barrel, from which streams of liquid pour out, to be drunk by other naked people, who then vomit or defaecate further streams of liquid. A group of people is pushing a boat made from a huge clog into the pond. There are many weird portmanteau creatures around, severed limbs, and scenes of mutilation and death. At the left is a huge lantern being used as a shelter by a man, who is naked apart from a bishop’s mitre, and women wearing wimples. On its top there are large musical instruments: a lute, bagpipes, and harp, on which naked people cavort and are being tormented. In the centre, a body rests prone on a huge knife, which is cutting it apart, while a masked figure swings at it with a sword. Others are in a cage being carried by a strange and outsized portmanteau mammal. In the middle distance are more scenes of carnage. A small army emerges from the right, with odd weapons and more weird creatures. Behind them a huge harpy, consisting of an old woman’s head and the folded wings of a bird, has a figure protruding from its mouth. Other figures are in harness, towing huge millstones which grind people below them. A forge is being used to roast the buttocks of more figures, and a clothed and hooded figure beats a person who is draped over an anvil. The port in the distance has a sailing boat under way, which resembles the head of a large toothed fish. Along its harbour walls, buildings are on fire, their flames lighting the scene around them. At the top, Christ is seated on an arc of light inside a light blue disk of sky, a darker blue sphere at his feet. He holds his hands out to show his stigmata, and his chest is bare. To the left of his head is a branch, and to the right a long knife. There are four angels, each blowing a straight trumpet with a pendant attached. Those pendants are pale, with a red cross. Between the angels are two groups of men, totalling about seven on each side. Hieronymus Bosch (c 1450–1516), The Last Judgment (right wing) (c 1495-1505), oil on oak panel, left wing 99.5 x 28.8 cm, central panel 99.2 × 60.5 cm, right wing 99.5 × 28.6 cm, Groeningemuseum, Bruges, Belgium. Wikimedia Commons. 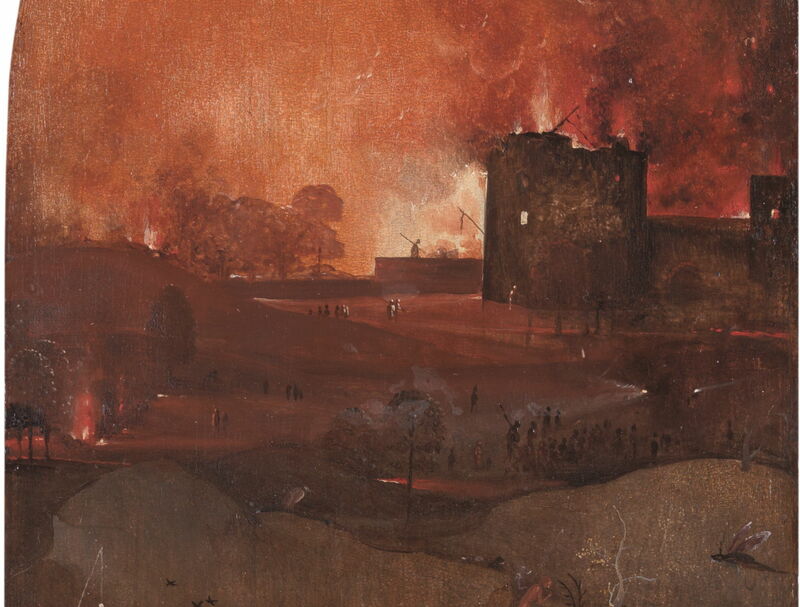 The right panel is darker and even more forboding, showing a thinner scattering of figures amid a landscape of war and death, its sky filled with flames and smoke from the burning buildings. The foreground shows a stretch of land in front of a tower, featuring bizarre portmanteau creatures. Two figures are inside a cauldron being towed by an ox, on which the rider is impaled with a long sword. Armoured creatures scurry around the tower, carrying siege ladders to scale a wall at the left. On the flat top of the tower, a figure climbs a ladder up a gibbet. Beyond the tower and wall, creatures ride and torment naked people. Scattered groups stand amid the ruins and remains. In the background large fortifications are silhouetted by the rising flames of burning buildings. Hans Memling (c 1433–1494), The Last Judgment (c 1466-73), oil on panel, dimensions not known, National Museum, Gdańsk, Poland. Wikimedia Commons. Hans Memling’s earlier The Last Judgment (c 1466-73) offers a more graded progression across its panels. At the left, the faithful are being admitted by Saint Peter to the gates of Heaven. The centre panel shows Christ presiding over the division of people into those destined for Heaven, and those doomed to Hell. This process is undertaken by armed angels and black devils. The fires and torments of Hell are then shown in the right panel. Note that the figure of Christ at the top has a white lily branch at the left of his head, and a red sword at the right, and that his feet rest on a golden sphere. He is also surrounded by apostles, the Virgin Mary, and angels. Lucas van Leyden (1494–1533), The Last Judgment (1526-7), oil on panel, central panel 269.5 x 184.8 cm, each wing 264 x 76 cm, Museum de Lakenhal, Leiden, The Netherlands. Wikimedia Commons. Lucas van Leyden’s slightly later The Last Judgment (1526-7) has a similar structure to Memling’s, and common iconography with that earlier painting, and Bosch’s work here, with the addition of a white dove above Christ (the Holy Spirit), and God the Father above that. Christ is shown seated on a similar arc of golden light to that shown by Bosch. Although Bosch’s original composition may have intended to follow a similar structure, there were extensive changes made during its painting, including the removal of the figure of God the Father from the top of the left panel. 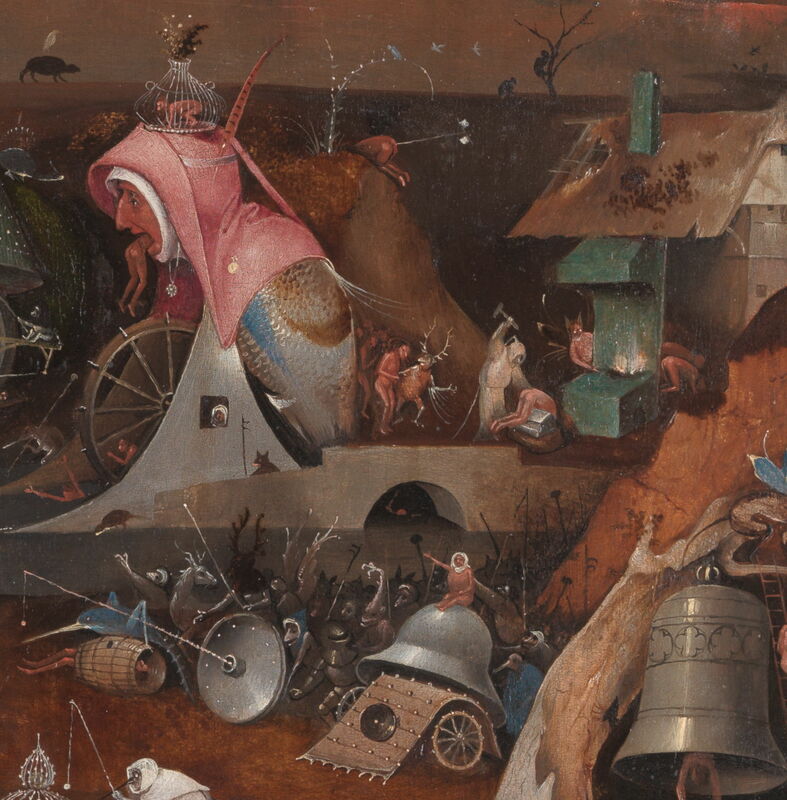 Although the left panel may still reflect some aspects of Heaven, or the Garden of Eden perhaps, or earth just before the Last Judgement, Bosch shows something of a composite of all three. Some suggest that the left panel is intended to be the Garden of Eden, although it has many more figures, and none aligns well with being Adam, Eve, or God. It could perhaps simply be Heaven, although its passages remain disquieting in parts, rather than comfortably idyllic. 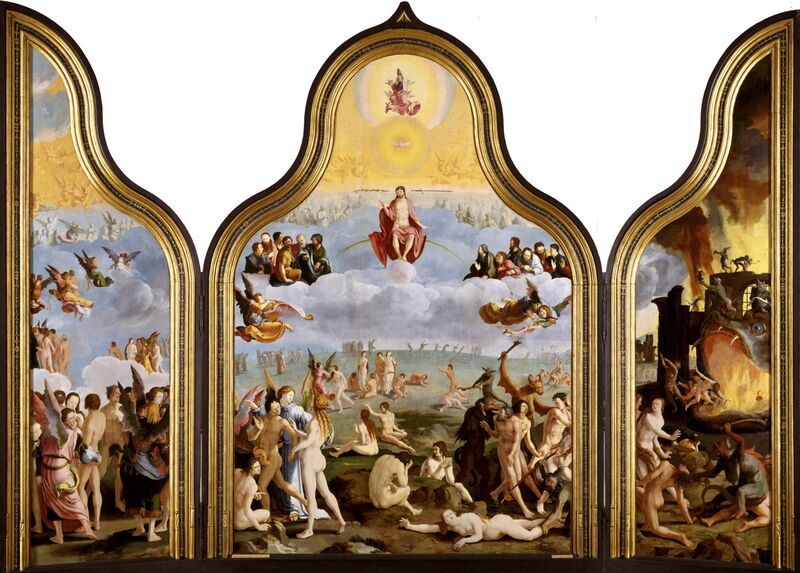 The centre panel does not appear to show the process of sorting people into those destined for Heaven, and those doomed to Hell, more the gathering chaos, torment, and death developing prior to the Last Judgement itself. This leads us to the right panel, which does not show a classical form of Hell, but the battles and destruction of the end of the world. It is in fact similar in its composition to the left panel in the Saint Wilgefortis Triptych, and there are similarities in their right panels too. Bosch’s vision therefore appears quite different from most. The three panels do seem to show a single more continuous scene, rather than three which are quite separate. However, more careful study of the ‘joins’ between left and centre, and centre and right, panels shows that the scenery is not intended to be properly continuous. This is most marked in the join between left and centre panels, further into the background. 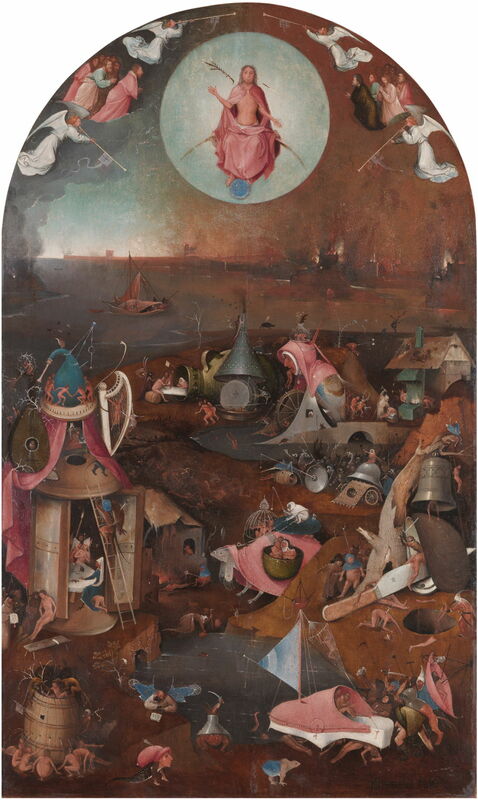 Bosch has also not maintained the same perspective projection: figures in the centre panel at any given height are considerably larger than their equivalents in the two wings. I have already mentioned some of the many strange passages seen in this triptych. Here are some close-ups. Hieronymus Bosch (c 1450–1516), The Last Judgment (left wing, detail) (c 1495-1505), oil on oak panel, left wing 99.5 x 28.8 cm, central panel 99.2 × 60.5 cm, right wing 99.5 × 28.6 cm, Groeningemuseum, Bruges, Belgium. Wikimedia Commons. 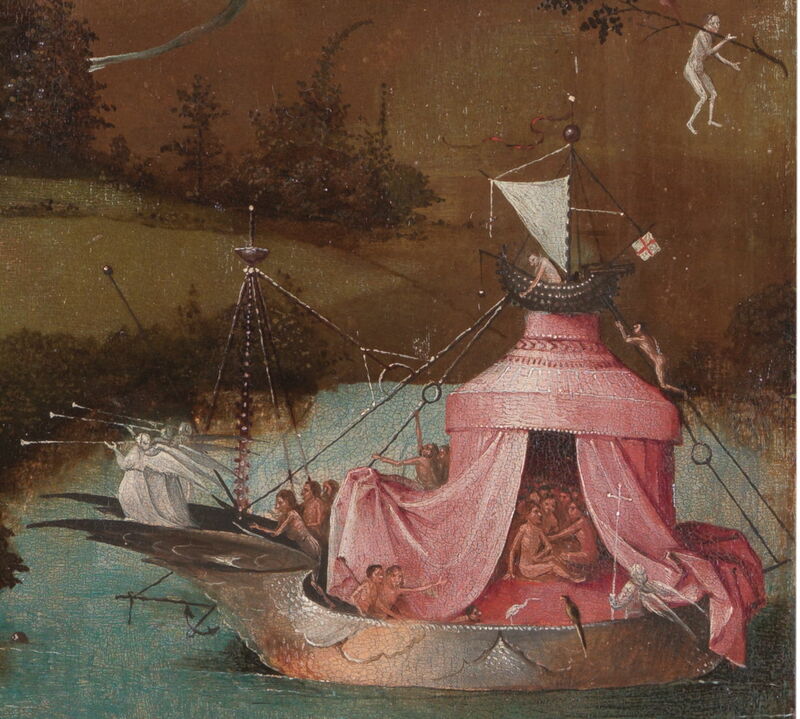 The boat on the left panel has a peculiar mixture of elements: a mediaeval circular marquee, angels with trumpets, and on its top a miniature of a ‘proper’ ship apparently being sailed by a lone occupant. It also has fantasy rigging. The fountain tower is quite distinctive, and different from the more fanciful versions in The Garden of Earthly Delights. It was apparently copied by other artists in Italy. 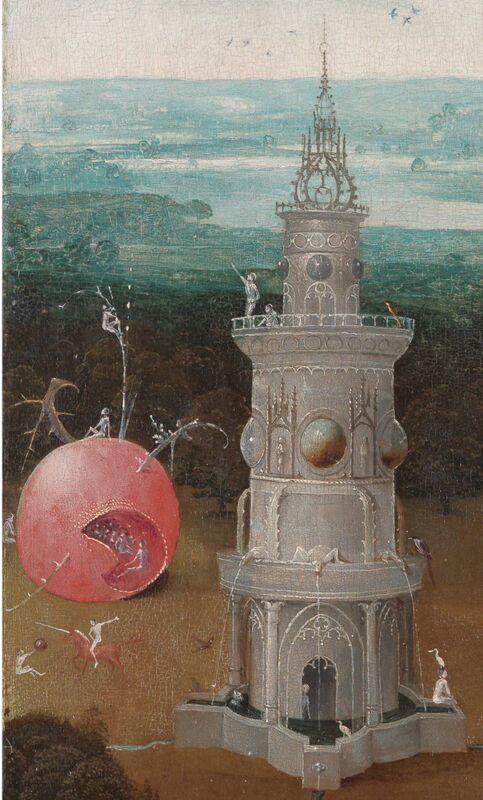 The massive fruit at the left is strongly reminiscent of The Garden of Earthly Delights, and probably alludes to the same symbolic meaning of fruit, for earthly pleasures. 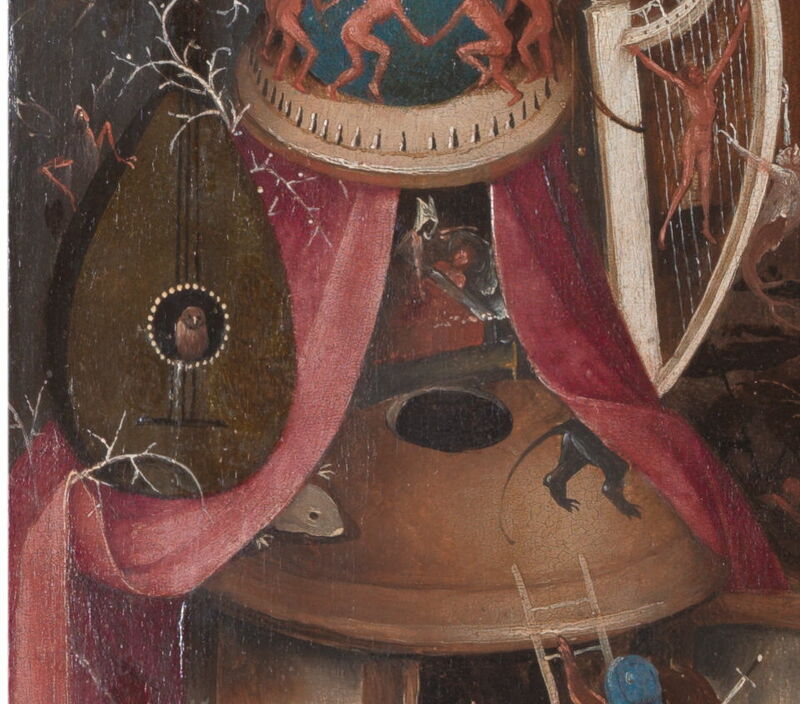 The musical instruments on top of the lantern booth are very similar to those in the right panel of The Garden of Earthly Delights, which also featured a hurdy gurdy. In that painting, the bagpipes were placed separately, on top of the Tree-Man, in its right panel. 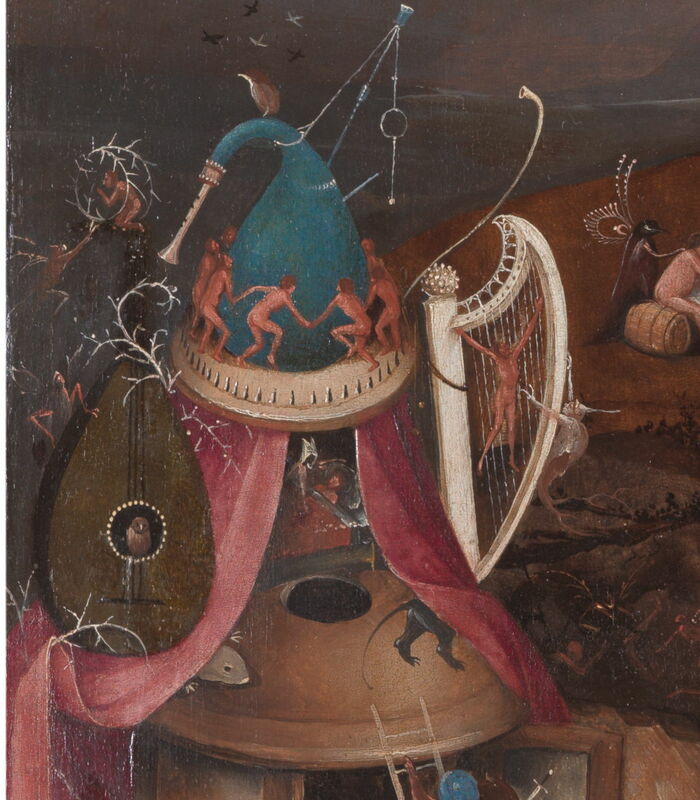 Both paintings show a figure being tormented on the harp. Some of the torments featured in the centre panel, which by convention should have shown the early stages of the Last Judgement, and division of people into those destined for heaven, and those doomed to hell. Instead, we see a series of scenes showing our worst nightmares of the latter, such as the painful punishments in the blacksmith’s at the top. Hieronymus Bosch (c 1450–1516), The Last Judgment (right wing, detail) (c 1495-1505), oil on oak panel, left wing 99.5 x 28.8 cm, central panel 99.2 × 60.5 cm, right wing 99.5 × 28.6 cm, Groeningemuseum, Bruges, Belgium. Wikimedia Commons. At the left of the right panel, a man and woman are boiled alive in a cauldron, but the figure on top of the ox has already been impaled by a long sword. 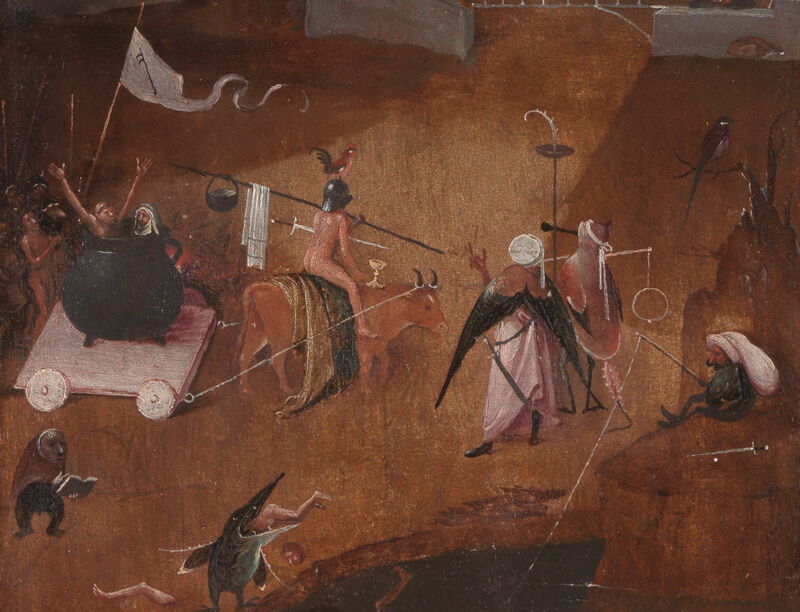 The small figure below the cauldron has a woman’s headgear and reads a book, features common through Bosch’s paintings. The distant scenes of war, conflagration, and destruction are similar to those seen in several other paintings by Bosch, including his Hermit Saints Triptych, Saint Wilgefortis Triptych and The Garden of Earthly Delights. Assuming that the left panel is not intended to show Heaven, a literal reading of this painting might appear bleak indeed: come the Day of Judgement, we are all doomed to go to Hell, and spend eternity in its tortures and torments. But that overlooks the crucial painting on the cover, and the links to redemption. This triptych therefore most probably represents a harder line, with more hellfire and brimstone, warning worshippers that – if they are not extremely pious – they are doomed. Strong stuff indeed. It is not known who commissioned this triptych, but by about 1520 it is believed to have made its way to Venice, only returning to northern Europe in 1900. Its exterior has had a hard life, with extensive damage to the grisaille painting there, but the interior has fared rather better. Indeed the grisaille was overlooked completely until it was rediscovered in 1959. It last underwent extensive conservation work in 2014-15. Matthijs Ilsink, Jos Koldeweij et al. (2016) pp 278-289 in Hieronymus Bosch, Painter and Draughtsman: Catalogue Raisonné, Yale UP and Mercatorfonds. ISBN 978 0 300 22014 8. Posted in General, Painting and tagged Bosch, Memling, painting, van Leyden. Bookmark the permalink.